80% of companies believe they are providing a superior customer service experience. But, only 8% of customers agree. Are you providing a superior service? The customer is firmly in the driving seat. So, how are you meeting and exceeding customer service expectations in 2019? We share 3 examples of brands that not only met customer expectations, but far exceeded them! These examples focus on quality, connecting with customers and going the extra mile. Customer expectations are difficult to meet. The higher they are, the more unlikely you are to exceed them. So, how do you meet and exceed customer expectations? The SuperOffice blog has mentioned it on a few occasions – The figures that show 80% of companies believe they are providing superior customer service, while only 8% of their clients agree with them. Contrary to what we would think, a BBC article discussed how some customers prefer rude and abrasive service – With one hotel in Liverpool, England seeing a 20% rise in bookings after a documentary aired showing their unpleasant staff. Confused about what customers really want? Do you want your business to be in that 8%? We will now cover the 3 main areas where most companies go wrong and discuss how to exceed customer expectations and provide examples of good customer service and how to improve them. We all like our issues to be resolved efficiently when contacting a company, but what makes us use them again and again? There is only one answer. The quality of the service! 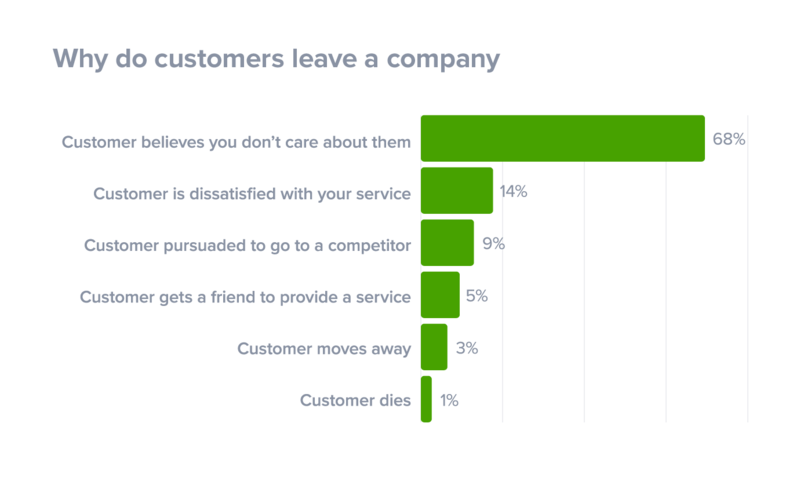 According to RightNow’s Customer Experience Impact study, at 82% the top reason customers would stop using a business was rude and incompetent staff. This was 18% more than their issue not being resolved swiftly. Despite this most businesses still use speed as their main measure of customer service quality. Europe’s biggest budget airline Ryanair plays a recorded message stating how they arrive on time more than any other airline in Europe whenever arriving on schedule. However some companies have taken the findings on board and seen great success. Derek Sivers the founder of CDBaby, asked all his employees to always take a little longer on calls with customers. He later sold the business for $22 million. Here is one example of how taking a little bit of extra time had a massive effect on one mans life. Another great and heartwarming example is from Kerry Drake, who was flying with United Airlines on his way to see in his mother in her final hours. After his first flight was delayed he broke down but, when the stewards on board realized the reason, the captain was able to radio ahead and hold his connecting flight until he arrived. He managed to spend a few hours with his mother before she died. Airlines rank each other on their ability to be on time. This kind of story and the fact it was global news. Show that customers see quality of service above any other any other measure. Advice: Remove time as a measure of quality and concentrate on getting your service right. Don’t ever make a customer feel rushed. Now you have a little more time. What do you do with it? In 2019, it’s no longer enough to be friendly and efficient in solving customer inquiries. You have to connect with them too. Pearl Weaver, who is 89 years young, certainly does that. Not only is she an inspiration in working longevity, but also in how to connect with customers. When anybody enters the Arby’s where she works, they are greeted to a booming smile, friendly welcome and shaking pom-poms. Her manager said “If she is off for a week, people ask where she is”! 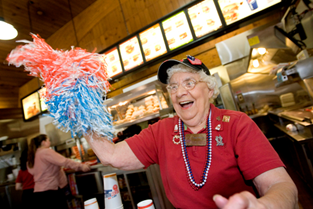 Just how many pensioners have you seen waving pom-poms working in fast food restaurants? That is how you exceed customer expectations! But how can you connect with customers when you communicate through email or web chat? Jill, a representative for online men’s clothing store Jack Threads received an instant message from a man who had found a hole in a shirt he had bought from them. He had not worn the shirt yet as he was hoping to fit in it after losing some weight. Jill firstly congratulated the client on losing weight, before asking for more information to help him return the shirt. The customer, Tony then went on to explain he was training for a marathon. Why did this conversation also go viral? It seems very simple right? But with so many companies so fixated on solving customer queries. Many have actually forgotten to connect with them. Advice: Ditch the script. Giving your employees more freedom makes them happier and more likely to connect with clients. Think about the best customer experience you have ever had. I imagine it involved a company or representative doing far more than what was expected of them. 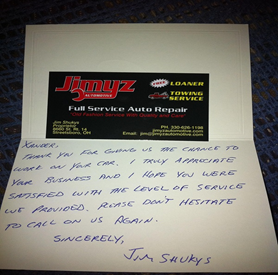 The team at Jimyz Automotives in Streetsboro, Ohio simply provide their clients with a handwritten thank you note. This not only helps to build your reputation and attract business, it also keeps customers loyal. When this photo was posted online, one of the responses was “I used to live in Streetsboro and I know exactly who that is. He’s a good man, stay with him!”. This kind of idea keeps regular customers loyal and makes your business the one they recommend to friends and family. From time to time a customer will give you the opportunity to provide them with a really memorable service. Like our next example. When a young Ritz customer left his beloved Joshie the Giraffe toy at the hotel, all his father could do was say that he had stayed on vacation a little longer. The father Chris Hurn emailed the Ritz to explain the situation. 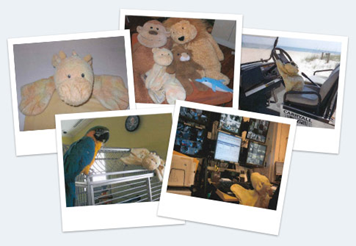 They responded by not only sending the beloved toy home, but by creating a photo booklet showing everything Joshie had done during his extra stay. If a hotel had done that for your child, would you stay anywhere else? Advice: Try to think of something memorable you can do for every customer. Also if you ever get an opportunity to do more, then do it. Customer service today is not about telling people how great you are and giving figures to prove it. It’s about creating memorable experiences that do the talking for you. Providing great customer service does not have to cost you the Earth either. Out of all the examples provided only one gift card was given. In fact, some companies who have excelled in customer service have even managed to remove their advertising departments entirely. When you also consider 85% of clients would actually be willing to pay up to 25% more to get better service. Why would you be doing anything else? How do you exceed customer expectations? Any tips you want to share? Go above and beyond customer expectations and download seven free email templates for customer service! Mark is a guest blogger for SuperOffice. After 3 years working in special needs education, Mark now strives to write simple, effective content. You can connect with Mark on Twitter. Very well explained. To exceed customer expectations, you have to be transparent, audience targeted, use of the latest technology and social media and, provide a clear timeline. Thanks! Liked your article. The tips are worth remembering. Thanks! Really interesting and understandable explanations on how to exceed customers expectations. I really appreciate it. Thanks a lot. I'm curious if anyone out there also believes that excellence is 'knowing your client', e.g., some clients find it annoying to be contacted repeatedly to show you care, others thrive on it. I for one, am so busy that exceeding my expectation means to know me, when to contact me with important information and when not to contact me with pleasantries. We can do that while conducting business. Am I a prude? I don't like to think so. I connect with people all the time... at the right time, I hope, as not to infringe upon their busy lives. Excellence for me is not to always be 'here', but be 'there' when I need your services and be there with the excellence described above. In summary I see client service excellence as preferred frequency, quality and delight. Really enjoy the article. That's a really great point, Peggy! To exceed customer expectations, you have to do something unexpected e.g resolve issues before it is escalated and accept mistake with solution at your finger tip always by imaging problems that can come up in the course of your duty. I totally agree! One of the best thing to exceed customer expectation is to be nice and not be rude to them. Thank you for this post. I enjoyed reading.